With the first set of preseason games completed, injuries and positional battles have begun to shack up depth charts. Mock drafts provide a great way to stay on top of news and find optimal windows to draft certain players. You can find this mock draft here. 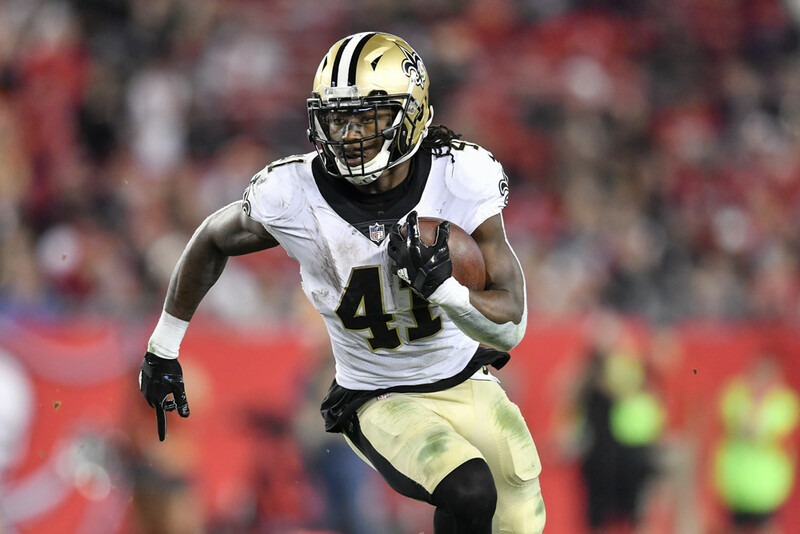 2017's rookie of the year, Alvin Kamara finished with 1,901 all-purpose yards and third in running back targets with 100. With Mark Ingram serving a 4-game suspension, Kamara should see an uptick in usage. Going ahead of Le'Veon Bell, Todd Gurley and David Johnson, Ezekiel Elliott simply does not see enough opportunity in the pass game to warrant the first overall pick. Elliott has 40 and 38 targets the past two seasons, while Bell and Gurley saw 107 and 87 targets respectively. In 2016 Johnson saw 120 targets. Sliding outside of the first round, Kareem Hunt becomes an auto-draft. Hunt finished 2017 with a league leading 1,327 rushing yards. Hunt also tacked on 53 receptions for 455 yards. Capable of playing on all three downs, Hunt belongs in the first round. While Christian McCaffrey's league-leading 113 targets provide a safe floor in PPR leagues, his ceiling is lower than players like AJ Green drafted after him. McCaffrey only saw 117 carries and the Panthers added CJ Anderson to the run game. The top half of the first round looks pricey for McCaffrey. Quietly eclipsing 800 receiving yards his last three seasons, Zach Ertz makes a smash pick in the fourth round. Ertz has target shares of 19-percent, 19-percent, and 23-percent the last three seasons and should see an uptick in volume with Alshon Jeffery nursing a shoulder injury. Nursing his own injury, Doug Baldwin looks questionable for the start of the regular season. An undeniable talent, Baldwin has already been ruled out for the entirety of the preseason with a knee injury. With questions surrounding health, third round draft capital is simply too high for Baldwin. As a 21-year old rookie, JuJu Smith-Schuster broke out for 917 yards after starting only seven games. With Martavis Bryant out of the picture, Smith-Schuster will step in as full time receiver for 2018. Look for him to improve on his 79 targets from a season ago. After being drafted in the second round, Ronald Jones has struggled so far during training camp. Coach Dirk Koetter even went on to name Peyton Barber the starting running back. Stuck in a time-share, Jones remains a reach in the fifth round. Despite almost a three round difference in ADP, Emmanuel Sanders has finished with nearly identical target numbers to Demaryius Thomas. In 2016 Sanders finished just behind Thomas with seven fewer targets. In 2017 they were neck-in-neck with 44 and 42 targets till Sanders injured his ankle in week five. After an up-and-down rookie season, Marlon Mack suffered a hamstring injury in the first preseason game. With the Colts adding Jordan Wilkins and Nyheim Hines this offseason, Marlon Mack cannot afford to miss any time. Last season, 33-percent of Mack's runs ended in no-gain or a loss of yards. The Ram's target leader from 2017, Cooper Kupp remains the cheapest of the Ram's pass catchers. Kupp also played a crucial role for the Rams in the red zone, finishing tied for third in the league with 23 red zone targets. After three injury-riddled season without reaching a 750 yards receiving, DeVante Parker finds himself in a make or break season. However, Parker recently broke a finger putting his week one availability in question. 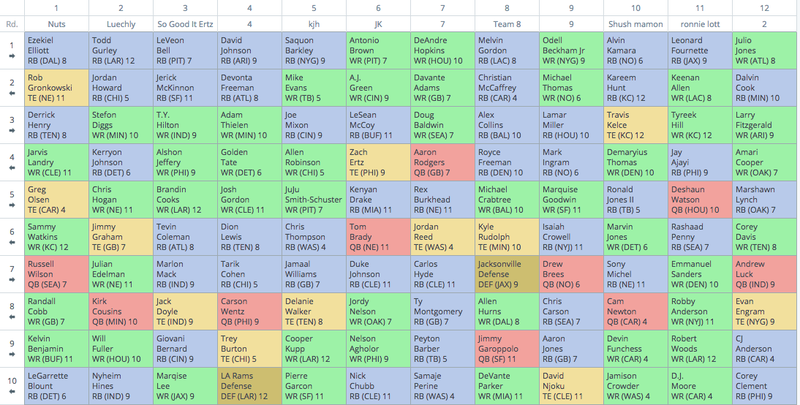 Kenny Stills remains the superior value a few rounds later.